This salmon recipe can be prepared with frozen fish and takes less than a half-hour to prepare. In blender, puree red peppers, 1/2 cup Parmesan cheese, cornstarch, jalapeno, and garlic. Blend in cilantro and chicken broth. In a small saucepan, cook and stir pepper sauce over high heat until boiling. Reduce heat; cover and keep warm. Cook gnocchi according to package directions; keep warm. Turn salmon over and sprinkle with lemon pepper seasoning. Cover pan tightly and reduce heat to medium. 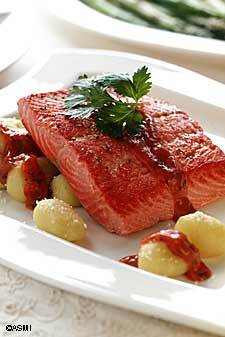 Cook an additional 6 to 8 minutes for frozen salmon OR 3 to 4 minutes for fresh/thawed fish. Cook just until fish is opaque throughout. To serve, add 1/2 cup Parmesan cheese to gnocchi. Portion 1 cup gnocchi onto each serving plate; drizzle with sauce. Top with salmon and drizzle with remaining sauce. Nutrients per serving: 482 calories, 23g total fat, 10g saturated fat, 44% calories from fat, 142mg cholesterol, 42g protein, 25g carbohydrate, 1g fiber, 799mg sodium, 330mg calcium and 1.4g omega-3 fatty acids.